ChinaFromInside.com presents... TAIJIQUAN - Excerpts from Chen Xin's "Illustrated Explanations of Chen Family Taijiquan"
Excerpts from "Illustrated Explanations of Chen Family Taijiquan"
Chen Xin (1849-1929), also called Pinsan, 16th generation descendant of Chen clan, was born in Henan Province Wen County Chenjiagou village. 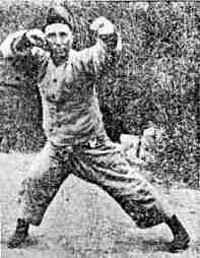 Chen Xin was a grandson of famous Taijiquan master, Chen Youheng; Chen Xin's granduncle, Chen Youben, had not only consummate skill in boxing, but on the basis of original routines created a new frame of Taijiquan (known as Small Frame, Xiaojia). Chen Xin's father, Zhongshen and uncle, Jishen, twin brothers, were both very skilful at Taijiquan. They first learnt from their father, Chen Youheng, but after he drowned in Dongting Lake, they studied with uncle, Chen Youben. Chen Zhongshen was extraordinary - big and tall - and studied martial arts since the age of three. He passed military examination together with his brother and became Wuxiang (military Xiucai). During the reigns of emperors Xianfeng (1851-1861) and Tongzhi (1862-1874) there were three renowned Taijiquan exponents in Chenjiagou: Chen Zhongshen, his brother Chen Jishen, and Chen Changxing's son, Chen Gengyun. Among them Chen Zhongshen was especially famous for using a 30-pound iron spear on battlefields and his courage. Chen Xin and his older brother Chen Yao were both studying boxing from their father, Chen Zhongshen. Chen Yao at the age of 19 passed military examinations at the county level and became Wuxiang; he practiced boxing ten thousand times a year and within 20 years his skill became superb. He was short and thin and people did not believe he was proficient in martial arts. Chen Yao often contested with guards of the local county magistrate (Yamen) and was able to throw six to seven on the ground at the same time. Chen Xin also learnt martial art since early childhood and understood its principles and methods, but since his father ordered him to study literature, his skill could not match the one of his brother. When Chen Xin was older he realized how little he achieved in literary studies and how accomplished Taijiquan master his brother was. Chen Xin regretted that he had not focus on martial arts practice and made a firm decision to write books and expound principles and methods of Chen Family Taijiquan. Chen Xin's most famous book on boxing is "Illustrated Explanations of Chen Family Taijiquan" (Chen Shi Taijiquan Tushuo). Chen Xin was writing it by hand for 12 years, from the 34th year of emperor Guangxu's reign (1908) until 8th year of the Republic (1919). There were together four volumes containing 200-300 thousand characters. Based on profound principles of Yijing (Book of Changes), the books were expounding changes between Yin and Yang; the meridian theory was confirmed using physiological points and veins; the applications of all postures were explained, indicating the key points for beginners. The results of many generations of Chen clan Taijiquan masters were written down without keeping anything secret. Silk reeling and neijin (internal strength) are the core ideas of the book. Chen Xin wrote many books that were never published, "Illustrated Explanations of Chen Family Taijiquan" was the fruit of many years' of his painstaking work and the most systematic and complete summary of Chen style Taijiquan. Chen Xin had no children and when he was lying in the bed old and sick he called his nephew Chen Chunyuan and gave him "Illustrated Explanations of Chen Family Taijiquan" saying: "this is the fruit of my whole life, publish it and give to those who deserve it, otherwise burn it, be sure not to give it to ignorant and presumptuous people!". Because of poverty, after Chen Xin passed away, the coffin with his body was kept for many years in his house and was not buried. Chen Chunyuan wanted to gather funds for funeral, so he asked his friends Du Youmei and Liu Yingxian for help in publishing Chen Xin's book.. As the result Chen Panling (president of Henan Province Martial Arts Academy), Han Zibu (president of Henan Archives Bureau), Wang Zemin and Bai Yusheng of Kaiming Publishing House, Guan Baiyi (director of Henan Provincial Museum) and Zhang Jiamou first raised 200 yuan for Chen Xin's funeral. Later they raised 800 yuan and in 1933 the book was published in thousand copies. In winter 1930 Tang Hao, martial arts historian and researcher, went to Chenjiagou with Chen Ziming to collect materials on Taijiquan's history and appreciated Chen Xin's manuscript very much. Chen Xin's "Illustrated Explanations of Chen Family Taijiquan" (also called "Chen Pinsan's Taijiquan Essentials" - Chen Pinsan Taijiquan Jiangyi) was originally written in 4 volumes with very clear explanations and not divided into chapters. No characters nor sentences were changed during publishing, and annotations were put in unclear places to keep original text intact. There were many generations of Chen Family Taijiquan practitioners since Chen Wangting. Many of them became very proficient at the martial art but very few books on Taijiquan were written. Seven generations had passed and starting from Chen Xin, more importance to written records was attached. In 1935 Chen Zhaopei, 18th generation descendant of Chen clan, in his "Collection of Chen Family Taijiquan" (Chen Shi Taijiquan Huizong) used many parts of Chen Xin's book. Chen Xin's other books include: "Taijiquan Guide for Beginners" (Taijiquan Yinmeng Rulu) (concise version of "Illustrated Explanations of Chen Family Taijiquan") in one volume, "Three-Three-Six Boxing Manual" (San San Liu Quanpu), as well as "Genealogy of Chen Family" (Chen Shi Jiacheng) in five volumes, "Collection of Poems and Literary Works from Calm Fool's Studio" (Anyuxuan Shiwenji; Anyu, Calm Fool, was Chen Xin's literary name) and other. Chinese reprint of Chen Xin's book is available through this site - click here! Only after I read about the Taiji circular illustration in ancient classics I realized that to practice Taijiquan one has to understand silk reeling essence. Silk reeling is a method of moving Central Qi (Zhong Qi). If it is not understood, then the boxing is not understood either. The first white path and black path are like Taiji Yin and Yang existing within Wuji (Limitless). The second white path and black path are like Taiji that gives birth to two Yi; these two Yi are Yin and Yang, e.g. Heaven and Earth. The third white path and black path are like Qi of Yin, Yang and Wuxing (Five Elements) that every man has and needs to live. The fourth white path is what Mengzi called Noble Spirit (Haoran zhi Qi); black path is man's Animal Spirit (Xue Qi, literally Blood Qi) which, if joins Morality and Justice (Daoyi), becomes Spirit of Righteousness (Zheng Qi, literally Upright Qi), e.g. Noble Spirit. The fifth white path is the Mind of Dao (Dao Xin), the one that governs Qi. Qi can not move without Principle (Li), this Principle is within one's Character (Xing). Black path is Human Mind (Ren Xin), what sages and men of virtue called Personal Mind (Si Xin). White point inside is Restraining Thought (Ke Nian), while black point is Deceitful Thought (Wang Nian). Only saints are able to keep Restraining Thoughts only and get rid of Deceitful Thoughts. Deceitful Thoughts are what Gaozi called feeding sexual desire (Si Se Xing). All humans have them. If a man could get rid of these selfish thoughts so that they would never appear, then (he would be) of pure heavenly nature (e.g. of pure primordial nature). (If one is) of pure heavenly nature, then while practicing boxing one would move following Nature's Mystery (Tianji), naturally, lively, the original shape of Taiji would be unintentionally revealed in my body. The three big external circles advance Yin and Yang from their beginnings; three internal circles say what Yin and Yang are being governed by. Three internal circles, e.g. what a man receives, are all within third circle, and originally there was no need to draw any further circles. (However since I) was afraid (that people would) practice boxing without understanding the principle of Qi governing, so there had to be another picture drawn, and (I tentatively) draw it to make it easier to understand. What is important is that three internal circles are all within third circle, third circle is within the second one, the second one is within the first one. This drawing explains particularly the core of guarding life (Wei Sheng), wonderful formula of Qi returning (Huan Qi). (If one) is expert in moving Qi (Yun Qi), only then one can guard one's life; if one can guard one's life, then there is support for one's Character Restoration (Fu Xing), and Qi can rely on (this). Such Taiji Boxing is a study beneficial for body (Shen) and mind (Xin), character (Xing) and life (Ming). Sages say that cultivating one's moral character lies in Character Restoration, which means guarding life and moving Qi are the core of cultivating one's moral character and restoring it. (I do) not know (if this is) correct or not, for the time being (I gave) illustrated explanation to make it more funny. Coiling power (Chan Jin) is all over the body. Putting it most simply, there is coiling inward (Li Chan) and coiling outward (Wai Chan), which both appear once (one) moves. There is one (kind of coiling) when left hand is in front and right hand is behind; (or when) right hand is in front and left hand is behind; this one closes (He) (the hands) with one conforming (Shun) (movement). There is also one (coiling) that closes the inside of the left (side of the body) and the back of the right (side of the body), and another which uses the through-the-back power (Fanbei Jin) and closes towards the back. All of them should be moved naturally according to the (specific) postures. Once Qi of the hand moves to the back of the foot, then big toe simultaneously closes with the hand and only at this moment (one can) step firmly. This power (Jin) comes from Heart (Xin), on the inside it enters bones, on the outside it reaches skin, it is one (power), not multiple (powers). Power is Qi that comes from Heart. If it is moved in central and right way, then it is Central Qi (Zhong Qi); when it is nourished, then it is Noble Spirit (Haoran zhi Qi). At the back (the power of) the head propping up is (called) Propping-up Power (Ding Jin); large vertebra is the dividing line, below (this) dividing line is the back (Lü), the central bone is backbone (Ji), both kidneys are (called) Waist. Whether foot is Empty (Xu) or Solid (Shi) depends on hand, if hand is Empty then foot is also Empty, if hand is Solid then foot is solid too. Taijiquan is the method of silk reeling (coiling). (There is) coiling forward, coiling backward, coiling leftward and rightward, coiling upward and downward, coiling inward and outward, small and big coiling, conforming (Shun) and contrary (Ni) coiling. Their importance lies in (ability to) coil once (the opponent) is lured (Yin) or once (one) steps forward ("enters" the opponent), and not in using specific applications of specific postures. If specific applications of specific movements are used, then Yin and Yang are not at their (movements and applications) roots. Common people (those who do not know Taijiquan) will see (the practitioner) as a weak (soft) one. This is the impression given on the outside. If talking in terms of the state of mind (Shenyun), when hands are crossed hardness and softness are equally used according to one's wishes. Those who are not long on this path (of Taijiquan practice) are not able to thoroughly understand these details. Both shoulders (should) drop down, both elbows (should) sink; delicate like a virgin seeing a man, unbridled like a fierce tiger descending a mountain. Hands are like a balance, weigh something and you know its weight. The path of martial arts practice is to have such a balance in your heart (mind). This invisible balance is to approach (examine) the opponent according to his movements forward and backward and his speed, using the spirit (mind) mastered in everyday practice. 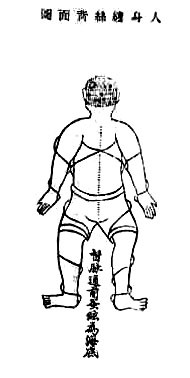 To weigh visible signs using invisible balance, and adjust according to what both hands feel, add less or more weight (when necessary), this (who is able to do it) is called Excellent Hand (Miao Shou, master). In movement Yang is born, stillness is in Yin, movement and stillness combined are the root. Without doubt you will find joy inside roundness, and see the Truth of Heaven through turns and circular movements performed at will. Yin and Yang have no beginning nor end, creation resides in coming and going, bending (Qu) and extending (Shen). Consider thoroughly this information, move the Vital Principle in round turns performed without restraint. Many moments of ignorance have to pass before the Principle will become clear, but with sudden inspiration it becomes (clear like) a glass. The Principle is without boundaries, but its sources are (even) in (little) ants. Do not peep at the garden for three years, have one will and focused spirit. It is necessary to study from a good teacher, and also visit wise friends. Follow the rules in all respects, and a narrow beam of understanding will appear. Next level is deeper than the previous one, the meaning within the levels is without boundaries. Opening (Kai) is linked to Closing (He), Openings (Kai) and Closings (He) pass on from one to another in order. Sometimes one is guided into victory, and cannot stop practicing even though one wants to. Time, study and efforts to the utmost, and your skill will grow every day. If only there is no obstacle, you will suddenly understand Great Void. THE NEXT TEXTS ON CHEN STYLE TAIJIQUAN THEORY AND PRACTICE FROM CHEN XIN'S BOOK WILL BE PUBLISHED SOON.